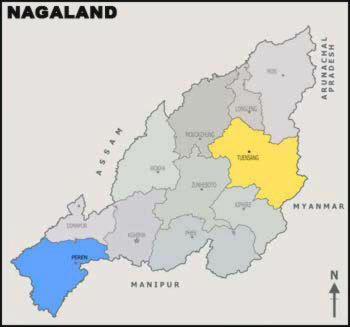 Nagaland is a hilly state covering a geographical area of 16, 579 Square Kilometres. One of the major reasons for rural poverty in Nagaland is related to the difficult terrain of the state with inadequate development and poor infrastructure. Almost every sector - agriculture, animal husbandry, industry, rural development, health, education, social welfare, etc. have been handicapped by the lack of infrastructural support. Most of the rural population is dependent on subsistence agriculture where the state governments' extension machineries have been challenged to intervene. Jhum cultivation practice is a matter of concern for the state. The land use management system is palpable and the land development for agricultural use is meagre with inadequate irrigation facility. This is further amplified by the prolonged dry spells during the winter. The poor level of infrastructure has also limited the opportunities for the rural enterprises, employment and income generation. The food (grain) security provided by the jhum cultivation practices is hardly for four to five months a year. The state is also confronted with one of the most critical problems related with youth and unemployment and unhealthy lifestyles, both in rural and urban areas. The problem of youth is a matter of social concern. Added to this is the insurgency problem and violence which has affected the state and its population in general and the youth in particular. Nagaland Government is implementing several rural development programmes, namely, Mahatma Gandhi National Rural Employment Guarantee Act (MGNREGA), Indira Awas Yojana (IAY) and Backward Region Grant Fund (BRGF) with active participation of communities. The Nagaland Bamboo Mission (NBM) has also offered a platform for employment of the rural population for alternative livelihood options since its inception in 2004. Like wise, the Nagaland Beekeeping & Honey Mission (NBHM) with its activities in livelihood options in apiculture and the Nagaland Bio resource Mission (NBRM) with its activities focused on the conservation and sustainable development of bio-resources, are also playing a critical role in addressing poverty reduction in small pockets of rural Nagaland. Nagaland Empowerment of People through Economic Development (NEPED) is a an organization which has been playing a crucial role in addressing the issues of poverty reduction and environment. Nagaland has a structure of Village Development Council. A separate Village Development Boards (VDBs) with Chairman of Council as its Chairman too for carrying out development activities in the village. Many government schemes are implemented by the Boards. To promote microfinance Nagaland has launched a pilot project to create corpus fund with each VDB that can be used to provide credit to the rural people.